Microgaming announced the new branded slot Tarzan that will be developed in cooperation with the owners of the Tarzan brand, and since this announcement, players have waited in anticipation for its release. Officially scheduled to be available in online casinos this December, vacationers have wonderful winning prospects to look forward too. Branded Tarzan video slot from Microgaming will simultaneously launch across all platforms including mobile, tablet and PC to offer players a wide collection of ways to enjoy combination wins across 5 reels offering 40 pay lines. Once Tarzan swings into action players also get to meet Archimedes, chimp, leopard and Jane and the symbols of higher value can cover up to two symbol positions while lower valued symbols include colourful fruits such as watermelon, apples, plums, and oranges. Readers can now enjoy our free demo slot to enjoy the game inspired by the novel Tarzan of the Apes by Edgar Rice. What appeals to Canadian as well as international players is the fact that loyal players not only enjoy an array of monthly cash prizes, deposit bonuses, and other excellent treats but also enjoy marvellous benefits from generous VIP programs. 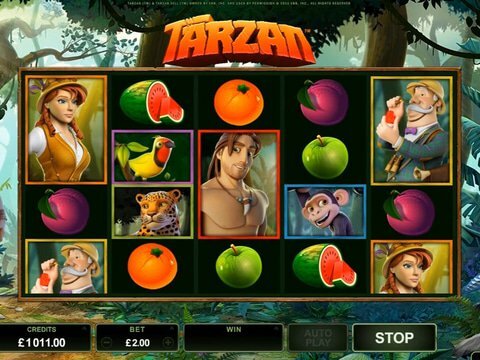 Tarzan video slot features an abundance of reasons to get highly excited about starting with its pleasant audio, colourful graphics, and its incredible variety of bonus features including rolling reels, free spins, growing wilds, pick-a-potamus bonus round, a bonus wheel, wilds and a jackpot worth 1,000 times your bet. While all features have the potential to increase your bankroll, tremendously the bonus wheel is most enjoyed due to its ability to award the 1,000 coin jackpot, free spins, pick-a-potamus bonus game, cash prizes or free spins within a spin. Should the wheel stops to award free spins its is indeed time to rejoice as your prize holds contains 12 free spins enhanced by rolling reels and winning opportunity supporting growing wilds. The free spins bonus round is well worth a Tarzan yell and promises maximum wins worth up to 2,750 times your bet. The pick a potamus feature award prizes according to the hippo selected from 12 hippopotamuses. The multipliers subject the total bet and can go from a minimum of 3x up to a maximum of 18x depending on the quantity of scatters that triggered the feature. If the bonus wheel pointer stops on the jackpot segment players can win up to 1,000 times their bet again depending on the number of scatters triggering the feature. If Tarzan excited you, you might very well enjoy another Microgaming slot with a similarly styled theme such as Tomb Raider 2, as it also features an adventure styled theme and is based on the famous Tomb Raider franchise. It features free spins, a Super Mode, bonus game and the chance to win up to $18,750 per spin. This non-progressive slot offers a per spin range of $0.30 and the highest $60.00. Based on a well know character & created by world leader Microgaming, the game is welcomed by all premier online casinos and we recommend play at Maple Casino. It is powered using the Microgaming software and delivers excellence in gaming. Our recommended casino awards players with great bonuses for registration and once a deposit is made a welcome package is available, containing several free bonuses and at times, extra free spins.